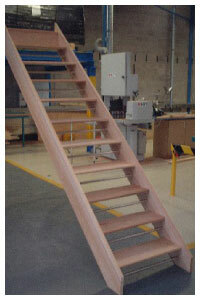 On this page we have some pictures of Open plan staircases. 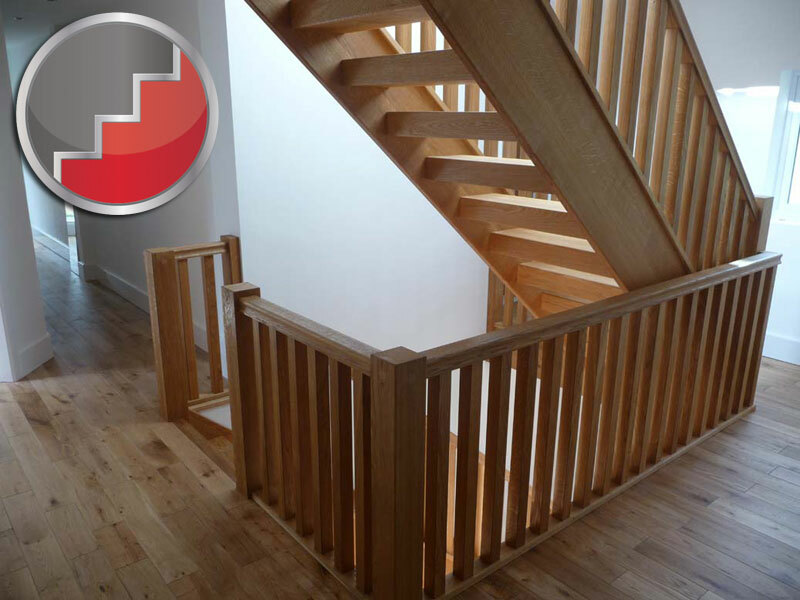 What is an Open plan Staircase ? Open plan is a staircase with openings where there are normaly risers, Building regulations state you must not be able to pass a 100mm sphere through the opening, this is why we have either a Riser downstand or a Bar on the drawings below. 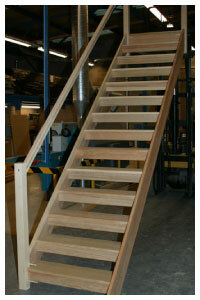 Open Plan Staircases are more expensive than closed staircases as they take longer to manufacture than closed. 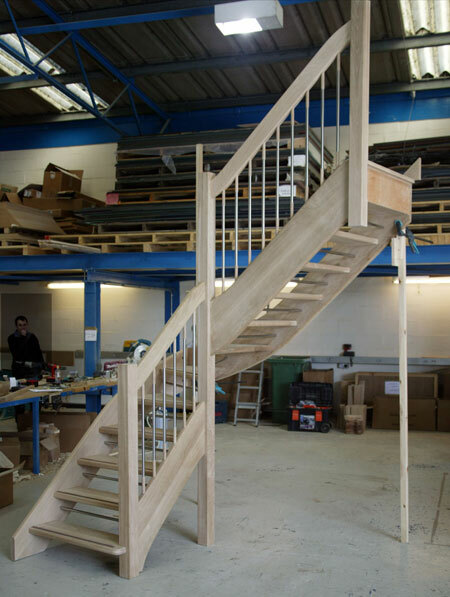 here you can see 2 Beech openplan winder staircases - the Beech used is a 40mm Engineered beech, these have single riser safety bars in stainless steel, this staircase is going to have the Fusion Handrail system for the balustrades. 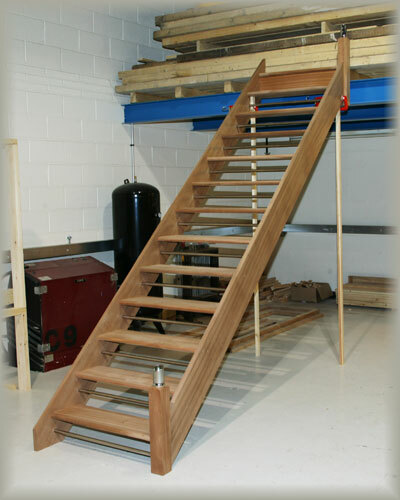 This Parana Pine openplan staircase has Traditional riser downstands to meet the 100mm sphere rule. 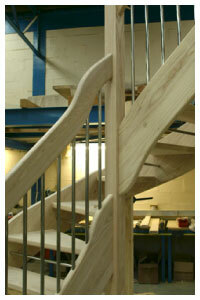 Beech openplan staircase with twin riser safety bars and the European style handrail. 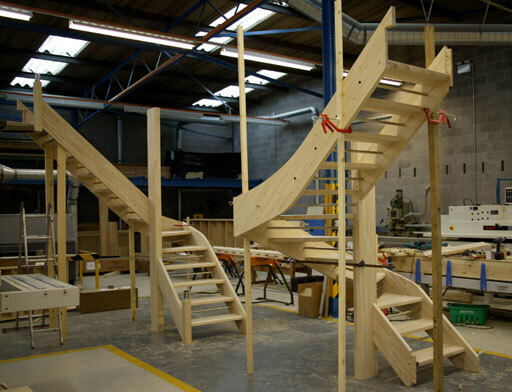 Pine openplan double winder staircase with single riser safety bars - whilst we manufacture Pine openplan staircases we recommend Openplan staircases to be in a Hardwood. 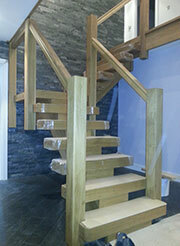 Oak Openplan staircase with a traditional square newel and square baluster detail. 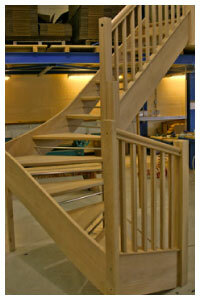 We also offer our openplan staircases in ash - shown here with the European style handrail. 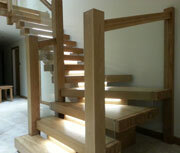 Oak Openplan staircase with the European style handrail and single riser safety bars. 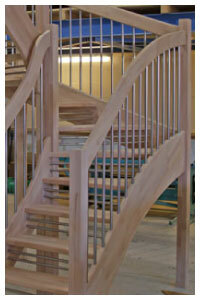 The Balusters are our New style European balusters with Oak ends and stainless steel to the Centre. This staircase also has non slip inserts in the treads. Find the plan closest to your requirments from our online library and Phone us for a quote. 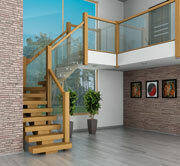 The Europaen style handrail is offered in Oak, Ash and Engineered Beech. Beech Openplan Staircase with S-Vision Balustrading Specification - 40mm Beech String and Tread Sections , Beech 90mm Square Newel Posts , SQHR Handrail in Beech (Special order) Stainless Steel Riser Safety Bars. Come to the Showroom to see the latest Townsend Style Staircase - This Chunky Oak Staircase offers contemporary style with its clean lines. 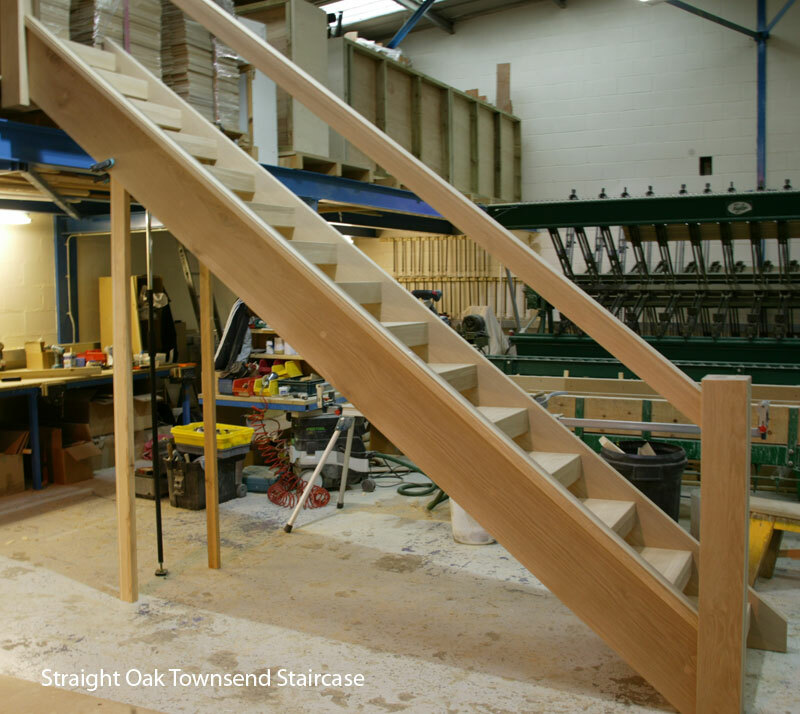 Above the new style Townsend open riser staircase, this heavy specification staircase design ooozes quality with only the highest grades of oak used. 55mm select oak stair balusters and 120mm select oak newel posts. 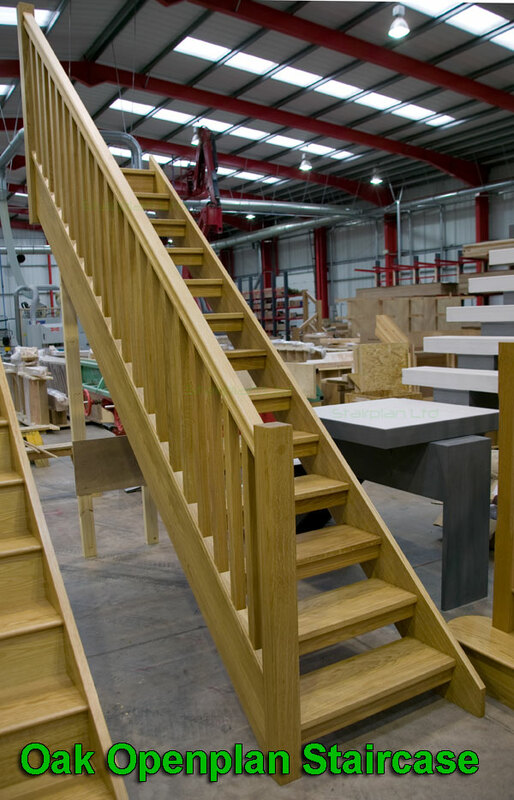 The X-Vision staircase is the ultimate open plan staircase , this staircase makes a statement in any home available in a selection of hardwoods and available to see in our show room. X-Vision staircase with optional LED lights. 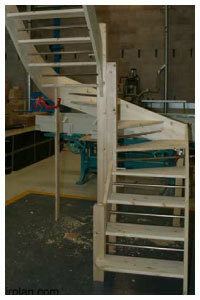 On this staircase above you can see the curved timber center spine - This is a Curved X-Vision staircase.